Description: Apache Camper Ctr is a business categorized under recreational vehicles, which is part of the larger category recreational vehicle dealers. 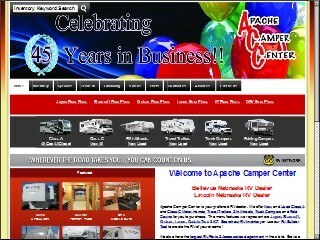 Apache Camper Ctr is located at the address 1120 Fort Crook Rd S in Bellevue, Nebraska 68005-2937. The Manager is David Sothan who can be contacted at (402)292-1455. Location & access map for "Apache Camper Ctr"